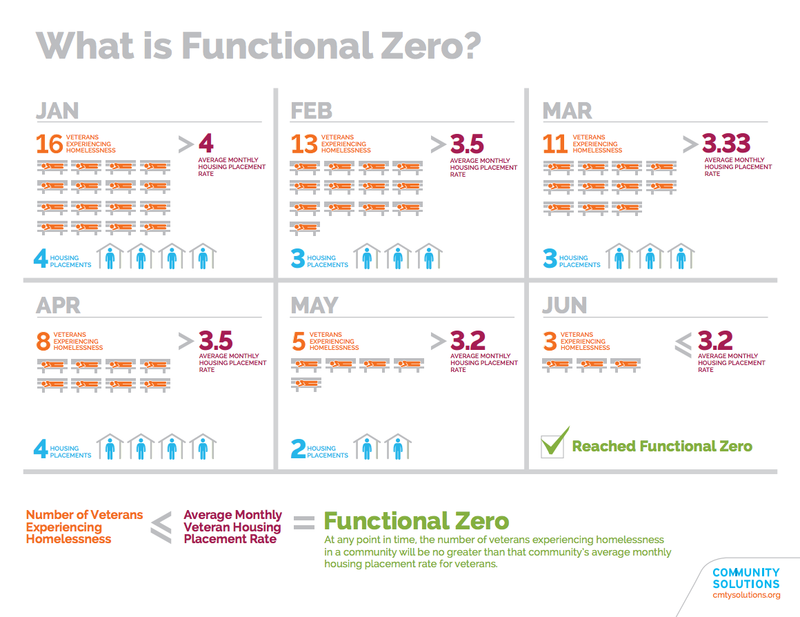 Infographic: What is Functional Zero? This week’s infographic comes to us from Community Solutions and looks at ending veteran homelessness. Community Solutions is an organization located in the United States that is working towards a future without homelessness. The organization takes a community-based approach for identifying the best tools that can solve the challenge of homelessness facing communities. The infographic itself is closely related to Zero: 2016, a “national change effort designed to help a committed group of US communities end chronic and veteran homelessness outright by December 2016.” The project has seen tremendous buy-in from communities across the United States. There is significantly more research available on the experience of homeless veterans in the States than in Canada. This can be misleading, and the absence of conducted research does not mean that homelessness is not a problem faced by Canadian veterans. In March 2015, Employment and Social Development Canada released a report of the first study to look at veteran homelessness nationally. The study was conducted using data collected at 60 emergency shelters from January to December 2014. The report estimates that 2,250 veterans use services offered by homeless shelters every year, and that there are higher rates of episodic homelessness for veterans compared to homeless non-veterans. The data is conclusive: homelessness is a problem faced by Canadian veterans. Functional zero, used in this context, is reached when the number of veterans who are homeless, whether sheltered or unsheltered, is no greater than the monthly housing placement rate for veterans. This approach and terminology is not without its critics. The project advocates for the immediate provision of supportive housing and wrap-around supports to homeless veterans. This is in contrast to the traditional approach to tackling homelessness, which largely consists of emergency responses to homelessness, such as emergency shelters. Homelessness in Canada and the United States is usually addressed in a treatment first approach, where individuals living in homelessness wait until housing is available, or are “treated” before being deemed fit for living in housing. It doesn’t have to be this way. The project advocates for Housing First, which can be defined as the provision of permanent supportive housing immediately to those in need. Time and time again, research has shown that Housing First is affordable, sustainable and cost-effective. While emergency shelters provide individuals with immediate relief in the short-term, Housing First is a solution that focuses on long-term outcomes and on helping individuals become independent again. There are numerous examples of successful applications of Housing First across Canada. These applications are tailored to the needs of local communities and populations. In Alberta, Nikhik Housing First/Homeward Trust highlights what agencies can do to integrate Aboriginal culture into a program. In British Columbia, the Streets to Homes project in Victoria demonstrates how large-city programs can be adapted to meet the needs of smaller communities. In Ontario, the Transitions to Home project in Hamilton provides a great example of how partnerships with police services can help identify individuals with high needs. These are just a few of the many ongoing Housing First projects that have had measured success in the Canadian context. If you have any question about the Housing First model, I invite you to participate in our very first Ask Me Anything (AMA). Wally Czech, Housing First Specialist with the City of Lethbridge, will be answering questions live on the online Community Workspace on Homelessness today at 1PM (ET). Post your questions now!